Education • Actress will encourage kids to participate in the arts. 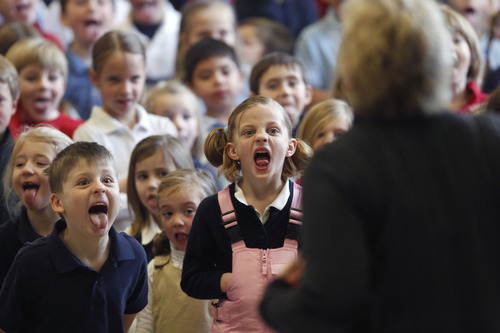 Al Hartmann | The Salt Lake Tribune No they aren't sassing their teachers. Canyon Rim Elementary students are stretching their mouths and tongues in an excercise lead by Actress Alyson Reed, the loveably, loopy drama teacher "Ms. Darbus" in Disney's High School Musical series. Reed partnered with the Salt Lake Acting Company for the series of theatre activities, including active learning assemblies, family night, and an actor's workshop for local students. Al Hartmann | The Salt Lake Tribune A sign on I-15 before Brigham City warns drivers of restrictions in Sardine Canyon Tuesday January 29 during the second installment of a major winter snowstorm to hit northern Utah. 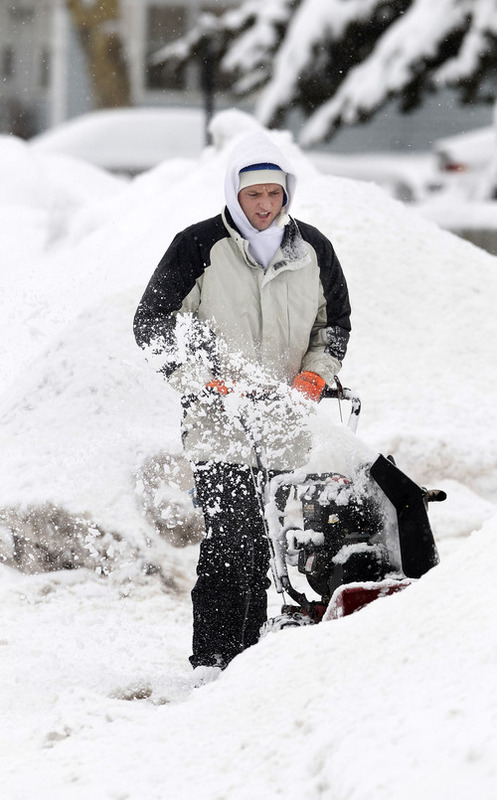 Al Hartmann | The Salt Lake Tribune Justin Kidd appears lost in a snowbank as he snowblows his neighbor's driveway in Brigham City Tuesday January 29 during the second installment of a major winter snowstorm to hit northern Utah. The piles along the street are 5-6 feet high with snow from the storms. 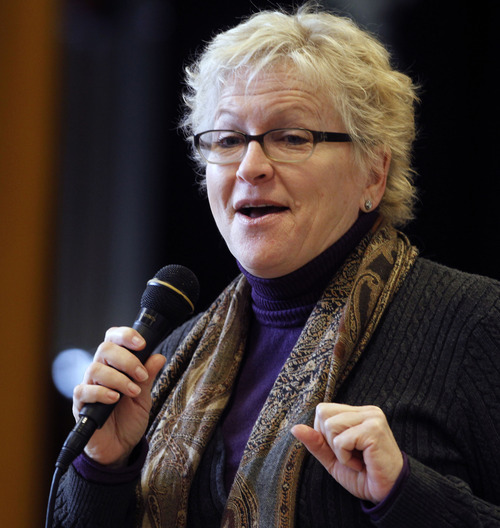 Al Hartmann | The Salt Lake Tribune Actress Alyson Reed, the loveably, loopy drama teacher "Ms. Darbus" in Disney's High School Musical series, leads a learning assembly at Canyon Rim Elementary Monday January 28. Reed partnered with the Salt Lake Acting Company for the series of theatre activities, including active learning assemblies, family night, and an actor's workshop for local students. 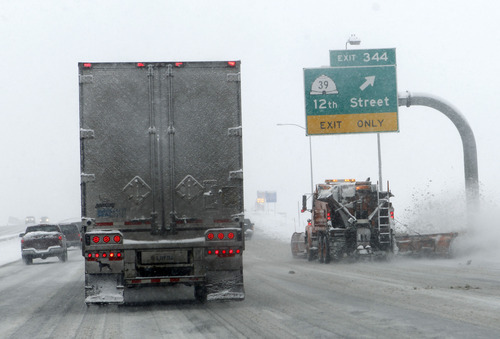 Al Hartmann | The Salt Lake Tribune It was slow going for commuters along I-15 in Ogden Tuesday January 29 during the second installment of a major winter snowstorm to hit northern Utah. 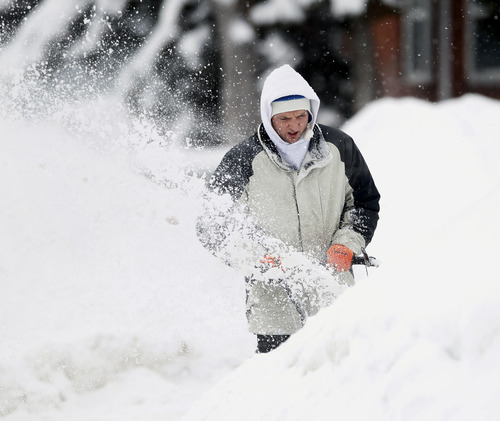 Al Hartmann | The Salt Lake Tribune Justin Kidd appears lost in a snowbank as he snowblows his neighbor's driveway in Brigham City Tuesday January 29 during the second installment of a major winter snowstorm to hit northern Utah. The piles along the street are 5-6 feet high with snow from the storms. Al Hartmann | The Salt Lake Tribune Actress Alyson Reed, the loveably, loopy drama teacher "Ms. Darbus" in Disney's High School Musical series, leads a learning assembly at Canyon Rim Elementary Monday January 28. Reed partnered with the Salt Lake Acting Company for the series of theatre activities, including active learning assemblies, family night, and an actor's workshop for local students. Al Hartmann | The Salt Lake Tribune Actress Alyson Reed, the loveably, loopy drama teacher "Ms. Darbus" in Disney's High School Musical series, leads a learning assembly at Canyon Rim Elementary Monday January 28. Reed partnered with the Salt Lake Acting Company for the series of theatre activities, including active learning assemblies, family night, and an actor's workshop for local students. Al Hartmann | The Salt Lake Tribune Actress Alyson Reed, the loveably, loopy drama teacher "Ms. Darbus" in Disney's High School Musical series, leads a learning assembly at Canyon Rim Elementary Monday January 28. Reed partnered with the Salt Lake Acting company for the series of theatre activities, including active learning assemblies, family night, and an actor's workshop for local students. 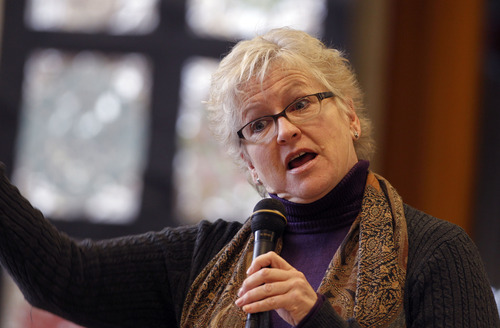 Actress Alyson Reed is reviving her character Mrs. Darbus, the loopy teacher from the "High School Musical" series, for a series of artistic workshops in the location the musical was filmed: Salt Lake City. 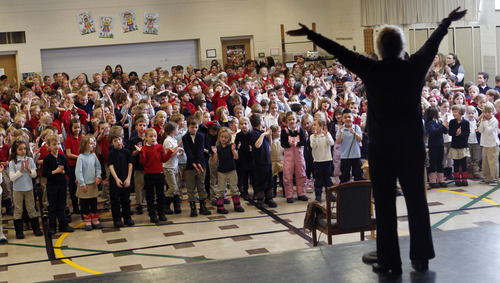 The veteran Broadway actress kicked a new arts program Monday at Canyon Rim Elementary. She will be conducting workshops throughout the week, including a Family Night open to the public on Thursday. "I have a real soft spot for Salt Lake City," Reed said. "99.9 percent of these students won&apos;t go into show business, but they will learn so many important things." Filmed in Utah, the original film in 2006 boasted catchy songs and energetic choreography by Emmy winners Kenny Ortega and Salt Lake City&apos;s Bonnie Story, and told the story of high school jock Troy (Zach Efron) and brainiac Gabriella (Vanessa Anne Hudgens), who join forces to star in the school musical. The movie was the highest-rated program for the Disney Channel and the soundtrack was a best-selling album. The movie, in addition to being a sensation in countries like India and Japan, has spawned theatrical productions and a touring concert. Reed has already taught a similar arts program to some 800,000 students in New York in what were called Active Learning Assemblies. Cynthia Fleming, executive producer of the Salt Lake Acting Company, said the timing was perfect to host Reed this week. She said the veteran actress&apos; theater games and master classes do more than captivate students through fun activities  they encourage conﬁdence, focus on developing students&apos; self-esteem, and encourage students to express their creativity. Fleming and Reed met more than 30 years ago when the pair performed in the national tour of "A Chorus Line." "There will be something for everyone," Fleming said. Elementary School Learning Assemblies • Starting on Jan. 28, Reed will perform her workshops at five Beverley Taylor Sorensen schools, where the arts are promoted at schools where students come from low-income homes. 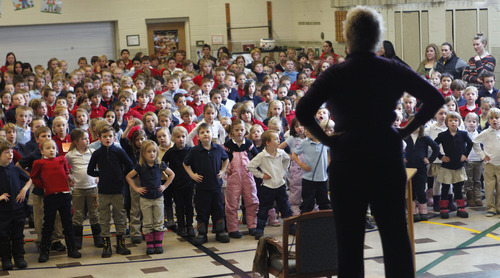 Throughout the week, Reed will perform the free educational and entertaining assemblies. Reed will engage with more than 3,000 students at Canyon Rim Elementary, Washington Elementary, Nibley Park Elementary, Wasatch Elementary and Bennion Elementary. Family Night • At 6:30 p.m. on Jan. 31 at Clayton Middle School (1470 S. 1900 East in Salt Lake City), Reed said she will host an evening that will have something for everyone, not just those interested in show business. The evening will include theater games, improvisation, scene work, mock interviews, and a question-and-answer session, among others. The tickets cost $5. Actor&apos;s Workshop • At 11 a.m. on Feb. 2, Reed will conduct a master class for serious students of acting ages 12-18 at Salt Lake Acting Company (168 W. 500 North in Salt Lake City). Tickets cost $25. Reed has over 40 years of professional experience as an actress, director, and private coach in television, ﬁlm and theater. Having worked with such luminaries as Bob Fosse and Richard Attenborough, Reed&apos;s acting credits range from a Tony nomination during her 15 years on Broadway, to staring as Cassie in the film version of "A Chorus Line, "to her portrayal of Mrs. Darbus in "High School Musical." "These are all the things I&apos;ve learned over the years," said Reed, 55, who started in show business at 12. "It&apos;s not just about the arts, it&apos;s about life." For tickets, call Salt Lake Acting Company 801-363-7522 or click on http://www.saltlakeactingcompany.org. P For tickets, call Salt Lake Acting Company 801-363-7522 or http://www.saltlakeactingcompany.org.